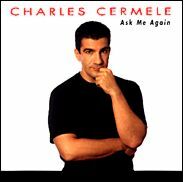 Charles Cermele is one of the few really interesting and individual male singers to emerge on the cabaret scene in recent years. His second album offers a greater variety of material than his debut, 1995’s Look In My Eyes, while remaining its equal in terms of quality. The program is pleasingly diverse. Alongside his accomplished interpretations of ballad material he offers humorous numbers – Harold Arlen and Yip Harburg’s You’re The Cure For What Ails Me and a deliciously droll take on the Rosemary Clooney chestnut Come On-a My House. Elsewhere, As Long As I Live is wry yet sweetly sincere. With WhoCares, Cermele demonstrates a more than respectable ability to swing and he misses none of the dark irony of the Gershwins’ Strike Up The Band. Perhaps most interestingly, the program includes a number of songs more usually associated with female performers. Of these, A Sleepin’ Bee from House of Flowers, sung with no gender-change in the lyric, is particularly successful when stripped of some of the melodrama often accorded it by other singers. Cermele is able to identify emotionally with this material without ever slipping into camp. Even when he sings, on Do It Again, "Mama may scold me ’cause she told me it is naughty, but then" he sounds earnest but never arch. He also manages to make the artfully coy lyric sound remarkably sincere. Cermele has a particular gift for presenting familiar – sometimes almost cliched – material in a fresh light. A prime example is Can’t Help Falling In Love. Taken at an unusually slow pace, and with an almost baroque arrangement, the song acquires hitherto unsuspected depths of intensity. Cermele’s strongest suit remains his way with a ballad. He has the vocal assurance of a traditional Italian-American crooner but none of the affectations or disregard for the rudiments of lyric interpretation that beleaguer many of the breed. There are definite echoes of Tony Bennett in the seeming contrast between his deceptively relaxed vocal tone and intense commitment to the words of a song. On I Remember You and My Shining Hour, he is completely at one with the material, gently teasing every nuance out of Johnny Mercer’s paeans to the enduring power of true love. On these, together with It’s A New World and the album’s title track, he accomplishes the trick of caressing the ear while still focusing his listener’s attention on the subtleties of each lyric. As on his first recording, Cermele’s vocals are enhanced and complemented by Christopher Marlowe’s complex yet supportive arrangements. As Eric Myers’ sleeve note states, a baritone is a rare thing in cabaret. A baritone as sensitive and versatile as Charles Cermele is rarer still. – Mark Jennett………….